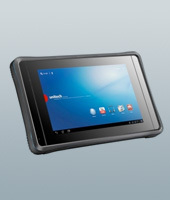 The Unitech TB100 rugged 7-inch tablet provides a great list of unique features for ultimate flexibility, and includes free software to help you easily manage and support your mobile business needs. Searching for a tablet durable enough to use in your business? Now you have the perfect match with the TB100. With a great list of unique features for ultimate flexibility and free software to help you easily manage and support your business tablet, it’s time to choose the high quality and rugged TB100. That’s why the TB100 is equipped with a 7” WXGA TFT LCD multi-touch display of Gorilla™ glass. This type of glass is not only offering excellent visibility inside as well as outside, it’s also a extremely durable. The combination of this unique glass, an anti-slip rubber bumper around the main body, an IP65 rating against moisture and dust and a 4ft drop threshold, makes this tablet is the solution for all your business demands. Don’t settle for a consumer grade tablet, choose a long term solution in the TB100!